The Precious Feet Necklace shows the foot size of a 10 week old fetus. 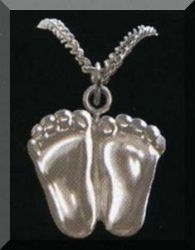 This Pro Life Jewelry features a silver finish. This is a perfect way to wear & display your Right to Life beliefs! This also makes a great gift for mothers or mothers-to-be!